Resident Evil 7's first-person take on the franchise is a bold experiment that holds tons of promise. The same could be said for Umbrella Corps, a new attempt by Capcom to graft multiplayer onto Resident Evil. Sadly, it doesn’t really work. Umbrella Corps sports mercenary groups of three facing off in constrained maps, both fighting one another and classic enemies from the Resident Evil series. So while your main objective is to take out the other humans, there are zombies, zombie dogs, and other things shambling around and getting in your way. 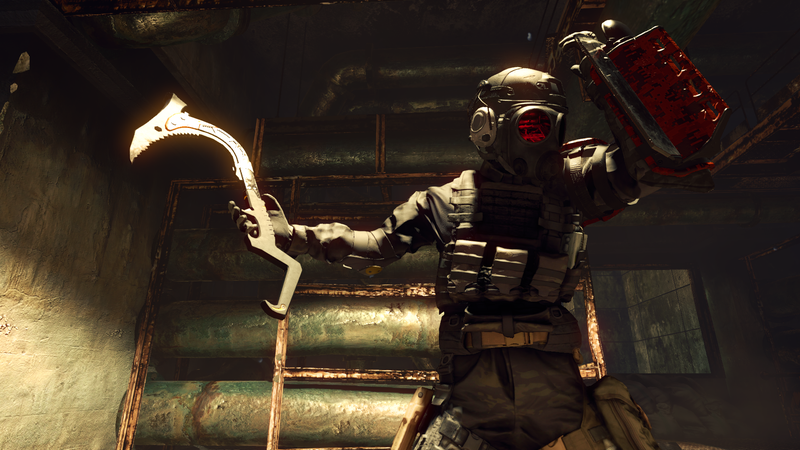 That alone is clever, but Umbrella Corps takes things a step further. You can attack the creatures for points, which feeds into your overall progression, but you might alert them and have to simultaneously defend yourself from zombie bites and human bullets. There’s a justification for the creatures not attacking you right away, too; each player is equipped with a “jammer” that, for whatever reason, distracts them. Players can toss grenades to temporary disable those jammers or fire a few bullets into their back, prompting the jammer to explode. There’s a delicious satisfaction in sniping someone’s jammer from a roof, hiding around the corner, patiently waiting for the horde to turn on them, and smiling as the game’s leaderboard gives you credit for a kill a few seconds later. These moments are too few and far between, unfortunately. Umbrella Corps just isn’t very much fun to play. There are interesting ideas at play here, with players being able to dash between spots using the cover system, but movement feels stiff, unnatural, and unwieldy. There’s a surprising amount of verticality, as well, thanks to the game’s multifaceted hook. The damage values for weapons seem all over the place, as well; it’s tough to tell why a shotgun can take out an enemy in one hit, while requiring 4 or 5 shots in other instances. Worse, Capcom buried Umbrella Corps. It was quietly moved from an earlier date in 2016, and Capcom did nothing to promote the new one. (The cynic in me wants to suggest Capcom is hiding it under RE7 coverage.) The result is a depressed player base, and for a multiplayer game that’s reliant on other people being around to have a good time, it’s a damning self-fulling prophecy. Without people to play with, the people who did buy it aren’t going to stick around long. It’s an especially dire situation on the PC, where I’ve sometimes waited more than five minutes to be placed in a match. So far, I’ve only been able to find people to play with in ranked matches, the spot you usually hang out in after you’ve gotten the hang of the game. Unfortunately, at least on PC, no one seems to be playing anywhere else. According to Steam Charts, the game’s player base has peaked at 428 people, which is...well, the numbers speak for themselves. If you’re playing on consoles, have you had a better experience? I’m the kind of Resident Evil fan that’ll give anything with the branding a shot. Unfortunately, that kind of mentality, perpetuated by dopes like me, has helped trend the series toward irrelevance. Resident Evil this, Resident Evil that. This used to be a sacred, industry-defining franchise. Now, it’s used to prop up games that aren’t worthy of the mantle. Hopefully, Resident Evil 7 can turn the tide.